Sometimes the best way to find your ideal job is through networking — by asking professionals you know in your industry to provide a formal business introduction to a desirable employer or to individuals who might otherwise advise you in your career search. When they agree to do this on your behalf, it’s important to immediately write a thank-you letter (or email) to convey your thanks to them and to express your appreciation for their time and effort. Not only is this basic good manners, but it will also strengthen your connection, demonstrate your professionalism, and lay the groundwork for a continuing positive relationship in the future. This is particularly essential if they themselves work for an employer to whom they have introduced you. In the best-case scenario, you will soon become colleagues and/or team members — thus, writing a thank-you note will help ensure that you have established a good rapport even before your first day on the job. 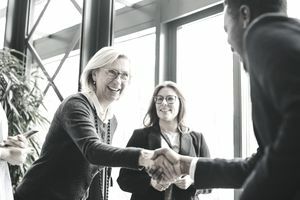 You can — and should — build your professional network in many ways: by attending industry conferences or other events, by attending job fairs, by expanding your LinkedIn connections in your field, and/or by reaching out to colleagues or mentors. When someone offers or agrees to provide you with a professional introduction, you need to write and send your thank-you letter as soon as possible — ideally within 24 hours. If you score an actual job interview as a result of their introduction, it’s smart to write a second note to update them on your status, thank them again, and express your enthusiasm for the employer. Send this second note even if, after an interview, you’ve decided you’re not interested in the job. You don’t need to explain your decision — and you definitely shouldn’t criticize the interviewing team or the company they contacted on your behalf. Simply express your gratitude for their assistance. Check, and double-check, for grammatical or spelling errors. It’s a good idea to have a trusted friend proofread your note before you send it. Even professional editors have trouble catching their own mistakes. Offer to serve as a professional reference or to provide introductions for them in the future should circumstances warrant. Here is a sample letter you can use as a model to send to a person who has provided an introduction to a contact who works in a company of interest. Thank you very much for introducing me to Theodore Mannix of Cryptic Industries. He has been very helpful to me during my job search and has even offered to put me in touch with some of his colleagues. I am hopeful that through these new contacts, I will find a new position soon. Your help and support during this search are greatly appreciated. Having someone with your knowledge and experience to confer with has made me feel much more confident during this difficult process. In most cases, it’s perfectly fine to send your thank-you letter by email. Doing so has several advantages over an old-fashioned paper letter, not the least of which is speed. Also, you can literally send your message in the lobby before leaving the building. Depending on your email program, you might also be able to get confirmation of receipt. If you don't have this option, you can always bcc (i.e., blind carbon copy) yourself so you're assured the email went through. Your email message should contain the same basic information as a regular thank-you letter, with a few exceptions. There is no need to include your return address or your contact's address. Simply include your contact information after your signature. You should keep in mind that digital readers tend to have short attention spans, so be brief and just get to the point. Here's some help with writing thank-you letters including who to thank and how to thank them, and networking letters and email messages to help you connect with those who can help you grow your career.